This afternoon, as science work continues all around, I took a short walk up to the ship’s bridge and chatted with Captain Mike and First Mate Scotty. They gave me a bit of history of the ship. 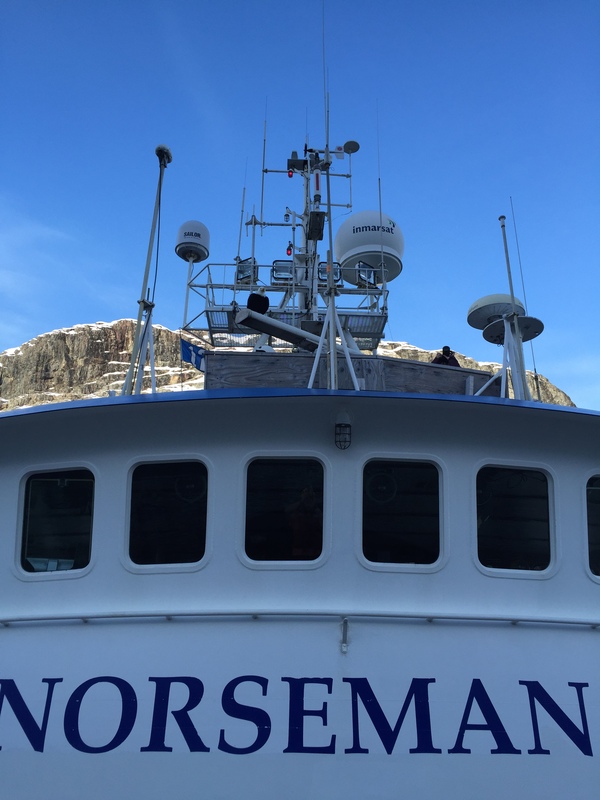 The R/V Norseman II is privately owned and based out of Seattle. In 2007 it was converted from an Alaskan king crab boat into a scientific research vessel, especially equipped for Arctic conditions. Oceanography and marine mammal research have been the focus of the voyages, which usually occur between April and November. 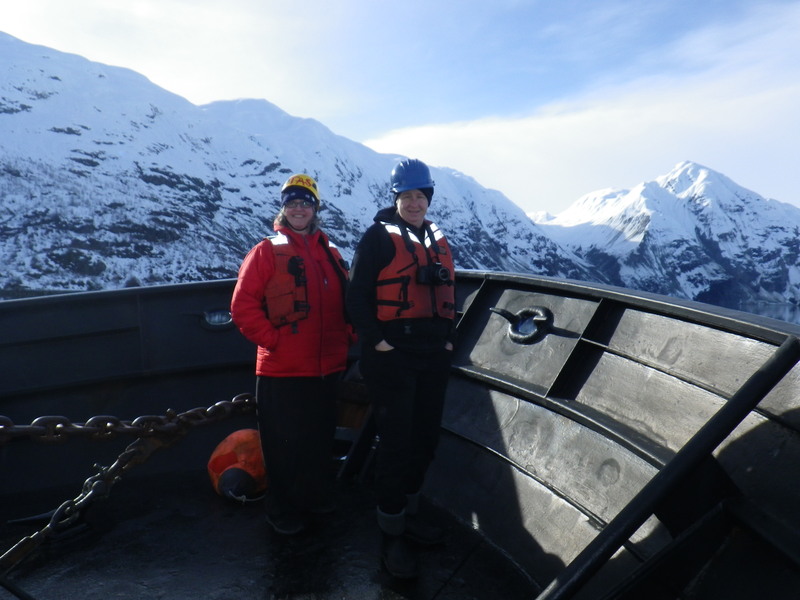 This is the first time they’ve had work in Glacier Bay. 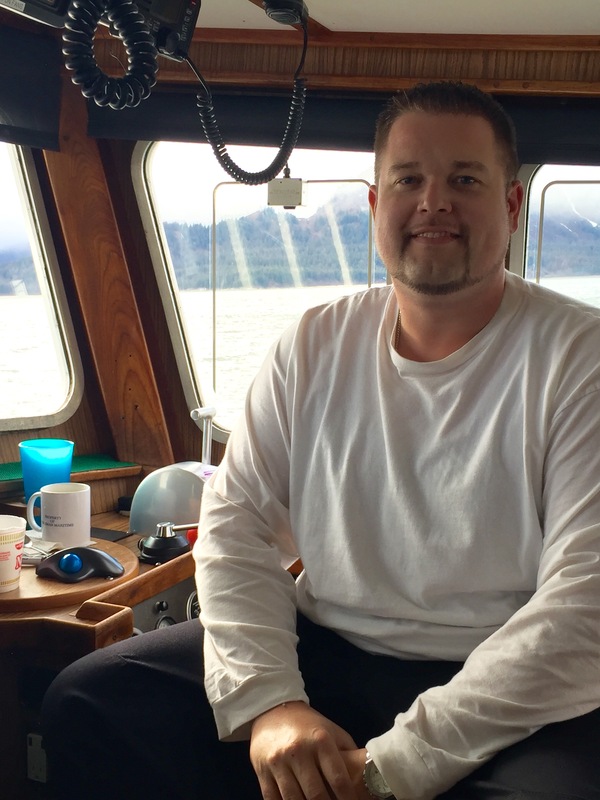 Scotty ranks Glacier Bay as one of his top five most beautiful places to see along the Alaskan coast! The ship’s bridge is where they pilot the ship. It has windows all around for the best view possible. The ship’s bridge is white with LOTS of windows! The Captain has a big comfy chair that sits up tall and allows him to have a good command of the ship. 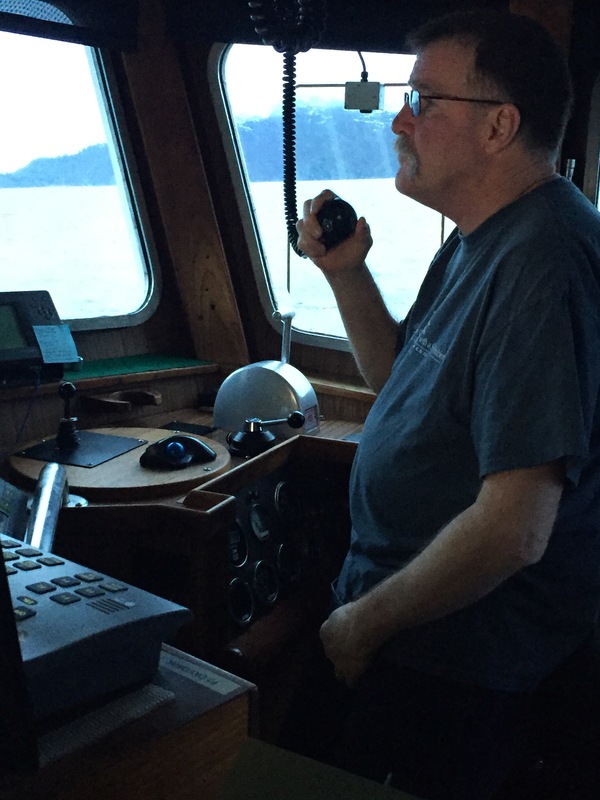 He can see the radar and bathymetry monitors, the navigational chart and has good access to the ship’s phone. On this cruise, Captain Mike works the 7-7 night shift because the ROV deployment off the back of the ship is a delicate and precise operation. The ship’s wheel and a giant compass are also on the Bridge. The wheel is wooden and old-fashioned looking but it really works and can be used to steer the ship in an emergency. During our conversation, I asked Captain and Scotty to share an interesting sea story. At first they didn’t think they had anything to say. I think everyone has a story. So eventually they began to reminisce. So the following are some sea stories that various ones on the ship were willing to share with me. 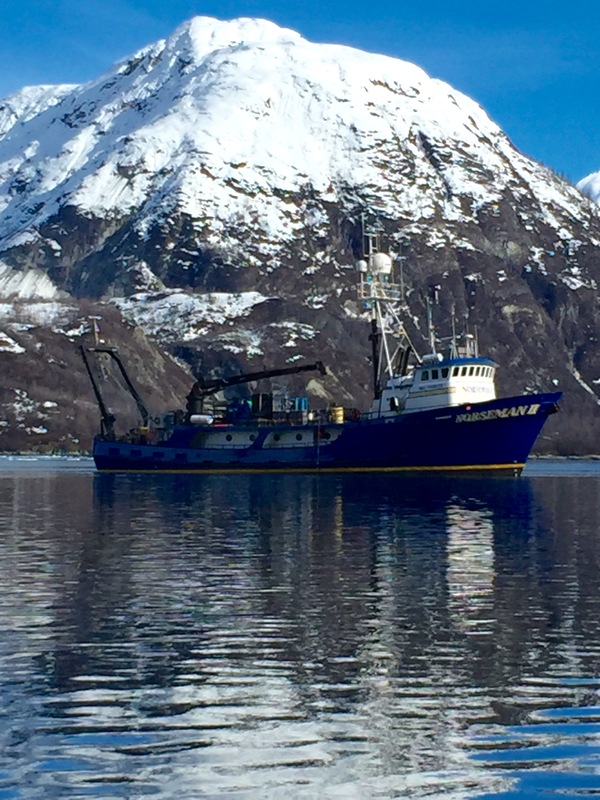 Captain Mike’s story occurred many years ago when he captained his 2nd fishing vessel. When we got to Sanak Island it was blowing a steady 80 knots with heavy freezing spray. The boat was getting heavier and heavier with ice building up on it. I couldn’t see out of the windows. There was ice on the inside of the windows about ½ inch thick. We went from Sanak Island to West Anchor Cove. It took me 12 hours to go only 8 miles. The scanner on the radar broke so it was just going in circles. We spent the whole night trying to get to safety. I wanted to go up in a little cluster of crab boats. The owner, on the other hand, wanted to go up in the bay. But that’s where the williwaws were blowing. (A williwaw is a downdraft from the mountains— a sudden blast of wind descending from snow and ice fields to the sea.) Ten inches of ice built up all over the boat. I could barely steer the boat. We were all very glad to make it to the anchorage. It took the crew five days to beat off all the ice from the boat. I have a very healthy respect for ice. It puts the fear of God in you. When we finally made it to our fishing spot, the fishing was great! We were in the Arctic doing a walrus study with the US Fish and Wildlife. There was a thick fog and we were slowly navigating through the ice. The walrus were very skittish and we were wondering why. As we rounded a corner, suddenly there appeared a big polar bear! I heard the Inupiat interpreter yell, “Nanuk!” A polar bear! (Inupiat interpreters work with us because of their vast knowledge of the ice and the animals.) Nanuk means polar bear in the Inupiat language. Now we knew why the walrus were acting so nervous. The bear crawled up on the ice and shook himself off. He jumped from one piece of sea ice to another, then back into the water. To be able to see an animal in its natural habitat was really something! Amanda’s story is set in the Southern Ocean near McMurdo Station, Antarctica. Amanda and two other researchers were returning to station from their fieldwork under the sea ice. They were riding in a Piston Bully, which is a specially designed vehicle on tracks for gripping the terrain on snowy, icy conditions. The visibility was terrible with the wind blowing the snow all around. Even though the station was less than four football fields away, they couldn’t see it. Amanda was sitting in the back of the vehicle watching for the guiding flags placed every 100 feet leading to the station. But she saw none. In that situation, protocol is to stop and wait out the storm. The driver kept driving even though he couldn’t see where he was going. Suddenly, the backend of the Piston Bully dropped into a huge crack in the ice! The doors in the back were wedged shut! Amanda automatically went for the emergency roof hatch. She couldn’t get it open! Something heavy had been stowed on top of it. The others had escaped but she was trapped! Everyone was fearful that the ice crack would open up and swallow the Piston Bully with Amanda inside. In a frantic adrenalin surge, Amanda kicked the hatch with all her might! The heavy equipment flew off as the hatch opened. Thankfully, Amanda crawled out to safety. The group waited out the blizzard for the next six hours in a nearby fishing hut. The Piston Bully fallen into a crack in Antarctica. Photo courtesy Amanda Kelley. I really am enjoying the great sea stories of the people assembled on board this ship! They are such adventuresome characters doing things I’ve only read about or watched in movies or documentaries. From living at the bottom of the ocean in Hydrolab, diving in the Southern Ocean around Antarctica, riding out the storm, fending off aggressive sea lions, working in the Alvin submersible, to exploring and making discoveries of the unknown—all are so interesting and awe-inspiring! I hope you enjoy their sea stories too! 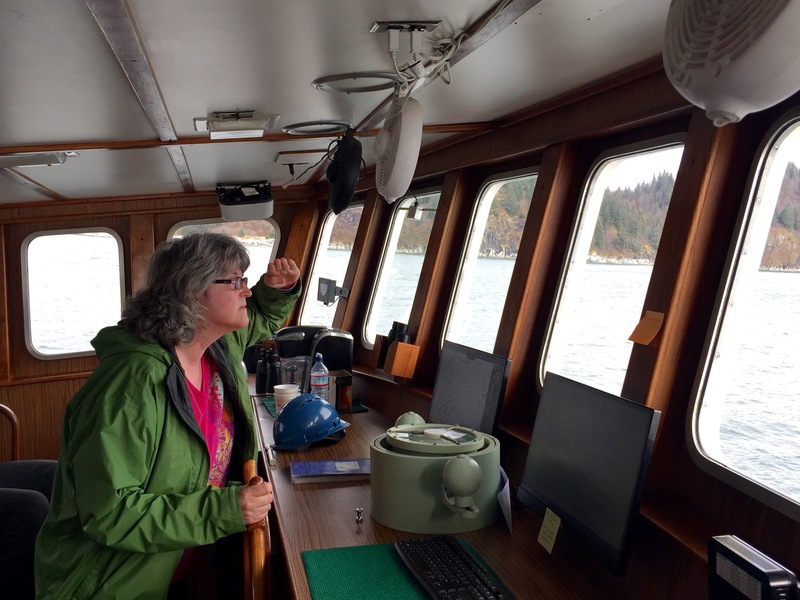 This entry was posted in 2016, Mary Cook 2016, NOAA Teacher at Sea and tagged Alaska, Amanda Kelley, bridge, bridge tour, Mary Cook, Norseman II, sea stories. Bookmark the permalink.